Hi. I need a "AMD PCnet Family PCI Ethernet Controller Adapter x64" for Windows XP Professional 64-Bit. Please can you upload this driver on the WinWorld website. I need this driver so that I can use Internet Explorer on a guest installation of Windows XP Professional 64-Bit. I am using VirtualBox to run this version of Windows XP. 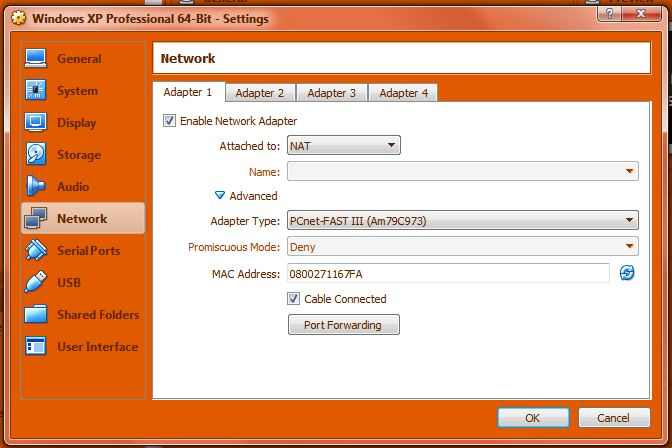 The only driver that I need is an "Ethernet Controller" driver for NAT "PCnet-fast III (Am79c973)" VirtualBox Network Adapter. Please can you upload the "AMD PCnet Family PCI Ethernet Controller Adapter x64" driver for Windows XP Professional 64-Bit on this site. I have searched for this driver online for many days and I cannot find it. Please upload the driver. Below is an image showing you the correct Network setting on VirtualBox. I need a driver for PCnet Fast III. Please kindly reply to me with positive answers as soon as possible. I looked at driverguide.com and all the drivers for the PCnet series of adapters were submitted in 2004 or prior (AMD64 windows first came out in 2005); the particular adapter was released in 1999. XP x64 is known for horrific hardware support so it's very likely no drivers exist. Try using a newer adapter or virtualize an x86 OS. Please can you find a compatible Ethernet Controller driver for Windows XP Professional 64-Bit. It does not matter what brand it is as long as it works with the x64 version of Windows XP. Use the Intel PRO/1000 Desktop ethernet card, which is provided in VBox 6.x. The guest additions will include the drivers. I have already installed the Intel Pro 1000 Desktop Ethernet Card. Internet Explorer still does not load web pages. It says "The web page cannot be displayed" error message. I need to use Internet Explorer to download updates for Windows XP Professional 64-Bit. I have tried all Network card and none of them work for Windows XP Professional 64-Bit. Please find another method to fix my issue. Which sites? IE6 can barely load anything these days, aside from Bing. Upgrade to IE8. Set up a shared network folder or drag-and-drop the IE8 installer. I am using Internet Explorer 8. It does not load web pages. Internet Explorer 8 cannot load any web pages. Not even Google. The reason for that is because I need an Ethernet Controller driver that works on Windows XP Professional 64-Bit.